Last week Russia-backed militants made a series of precision attacks upon the positions of Ukraine’s Joint Forces in the area of Stanytsia Luhanska, Avdiivka, Maryinka, Starohantivka, Pavlopil, Vodiane and Hnutove. Russian proxies fired upon the Ukrainian troops’ strongholds near Avdiivka using 82-mm mortars, grenade launchers and small arms. They also fired upon the Joint Forces’ positions outside Pavlopil and Vodiane from automatic and hand-held grenade launchers as well as from small arms. 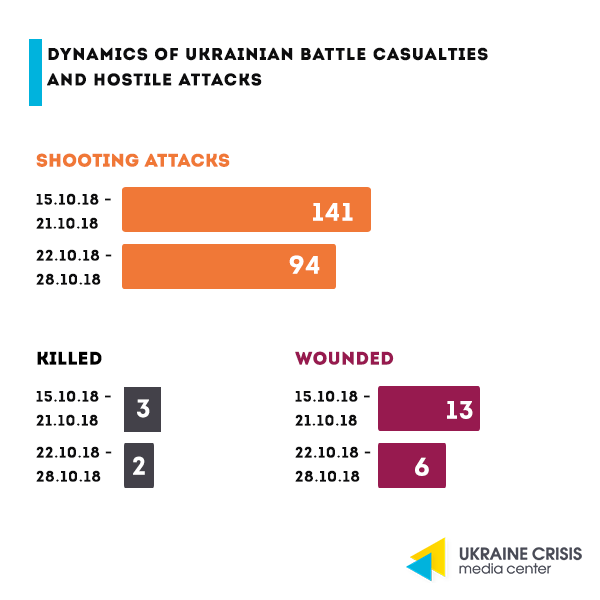 On October 25, Ukrainian troops’ positions near Svitlodarsk came under fire from the weapons mounted on infantry fighting vehicles and 120-mm mortars. Same weapons alongside 82-mm mortars were used in a hostile attack on Joint Forces’ strongholds near Luhanske and Avdiivka. 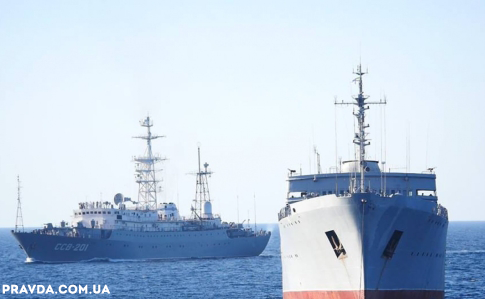 On October 25, the European Parliament passed a resolution condemning Russia’s actions violating the international law in the Azov Sea. The document calls on EU member states to clearly state that the targeted sanctions against Russia will be reinforced in case the standoff in the Azov Sea escalates further. One of the paragraphs of the resolution suggests introducing the post of the EU Special Envoy for Crimea and Donbas while the area of responsibility of the incumbent would also cover the Azov Sea. The European Parliament also “deplores the illegal extraction of oil and gas resources by the Russian Federation from Ukrainian territory; highlights the possible danger of Russia seizing existing Ukrainian oil and gas fields in the Sea of Azov once it achieves its aim of transforming it into an internal lake within the Russian Federation.” The full text of the resolution is available here. The first Ukrainian laureate of the prize. Ukrainian film director and Kremlin’s prisoner Oleg Sentsov was awarded the Sakharov Prize – the European Parliament’s annual prize “for Freedom of Thought”. Sentsov has become the first-ever Ukraine representative to receive the prize. Oleg Sentsov was nominated for the Sakharov’s Prize by the European People’s Party, the largest faction in the European Parliament. President Poroshenko’s comment. 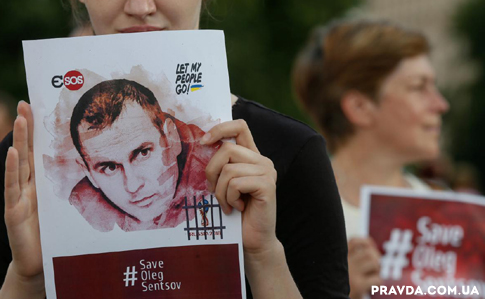 The President of Ukraine Petro Poroshenko is convinced that the Sakharov Prize awarded by the European Parliament to Oleg Sentsov illegally imprisoned in the Russian Federation, brings closer his liberation. “Grateful to the European Parliament for an important decision – to award the prestigious Sakharov Prize to Ukrainian Oleg Sentsov. (…) I am sure that this decision by the European Parliament will bring close the moment of Oleg Sentsov’s liberation,” President Poroshenko said. Commentary of Ukraine’s Foreign Affairs Ministry. Ukrainian film director Oleg Sentsov will play the same role in the history of the Russian Federation as the academician Andrei Sakharov played in the history of the USSR, Ukraine’s Foreign Affairs Minister Pavlo Klimkin is convinced. “After Oleg Sentsov ended his hunger strike, the Russian Federation was hoping to quiet the issue and bring this emotional wave down. However it got quite a different spin: at first the Polish prize, and now such a recognition as the Sakharov Prize 2018. Sentsov will become for Russia what Sakharov became for the USSR,” Minister Klimkin wrote on Facebook last Thurday. Richest Ukrainians: who are they? 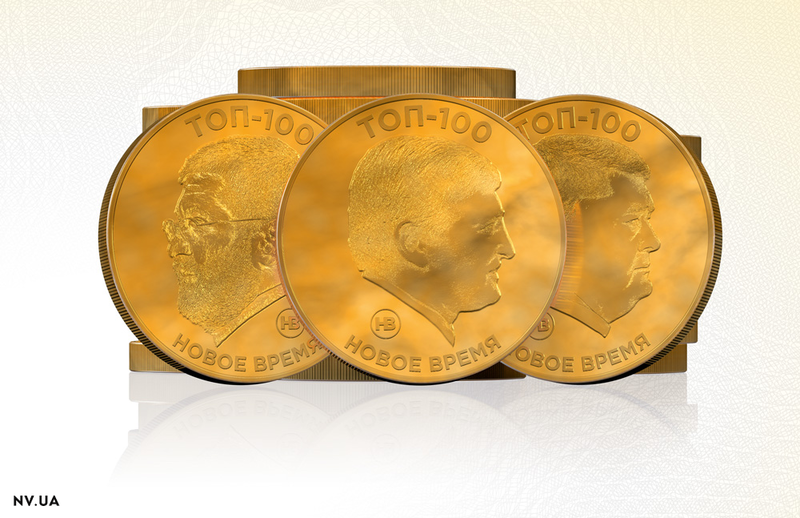 Ukrainian media “Novoe Vremya” (New Time) released a ranking of 100 wealthiest Ukrainians. These richest individuals of Ukraine accumulate USD 37,5 billion in their possessions, that is an equivalent to a half of the state debt. If counted jointly their assets have increased their growing speed from 33 per cent recorded last year to this year’s 43 per cent. The media notes that the assets are growing 12 times faster than Ukraine’s GDP. Rinat Akhmetov stays on top of the ranking. Resulting from the increased demand on metals his assets made a one-time increase by 76 per cent or USD 5,3 billion. Viktor Pinchuk was ranked second. His assets never got back to what they used to be prior to 2013 but did increase by 87 per cent. The third position was assigned to Vadym Novynskyi who owns Smart-Holding, the company holding a 25-per cent share of Akhmetov’s Metinvest. Petro Poroshenko was ranked sixth. This year his assets grew by 10 per cent and reached USD 1,1 billion. According to a recent opinion poll by the Kyiv International Institute of Sociology (KMIS), 30,4 per cent of the interviewed said that establishing peace in Donbas generally depends on the Ukrainian authorities; 16,5 per cent consider it lying within the responsibility of the Russian authorities; 10,4 per cent attribute it to the responsibility of the so-called “DPR” and “LPR”; 10,3 per cent – to “having the politicians’ interests satisfied at war”; 7,6 per cent – to the western states. When asked about the politicians or opinion leaders whose statements find respondents’ approval at most, 10,7 per cent of respondents named Yuliya Tymoshenko; 10,6 per cent Anatoliy Hrytsenko; 8,8 per cent the Radical Party leader Oleh Lyashko; 8,1 per cent singer and civil society actor Svyatoslav Vakarchuk. Ukrainians perceive Viktor Medvedchuk as a crony of the President of Russia Putin who is godfather to his daughter (35 per cent of the interviewed). Ukrainian tennis player Elina Svitolina triumphed at the season-ending Women’s Tennis Association (WTA) Finals in Singapore. The Ukrainian beat US athlete Sloane Stephens in three sets scoring 3:6, 6:2 and 6:2. Svitolina won the final WTA tournament for the first time claiming the biggest title in her career. The tennis player takes part in it for the second time – in 2017 she did not make it out of the group.